When the first seminarians of the Institute approached Msgr. Gilles Wach, STD, it was not easy to find a bishop to encourage the adventure of a new religious community. At this moment, the situation in France did not seem to allow any progress in this direction, but during a meeting in Paris, Msgr. Wach encountered His Excellency Bishop Obamba, Shepherd of the Diocese of Mouila in Gabon, Africa. Bishop Obamba asked our founder whether it would be possible to have some of his future priests serve as missionaries in his diocese. 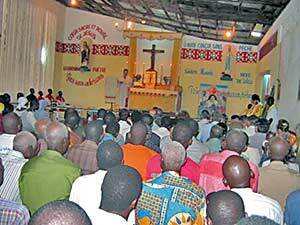 If so, he would consider allowing the canonical erection of the Institute of Christ the King Sovereign Priest in the Diocese of Mouila. Msgr. Wach immediately understood that Divine Providence was at work. He promised to Bishop Obamba the help of the Institute in the future. 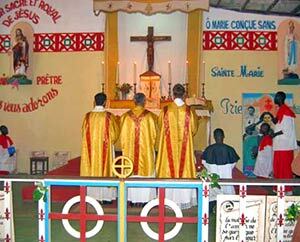 From this time on, priests of the Institute have always been present in Gabon and have worked with success under Bishop Obamba, and upon his retirement, under the then apostolic administrator and current Archbishop of Libreville, the Most Reverend Mve Engone, as well as under the present bishop of the Diocese of Mouila, Bishop Dominique Bonnet. Some of the Institute’s missions are located in the middle of the jungle. We have restored and constructed several churches, chapels, schools, kindergartens, and medical dispensaries. The native population is very attached to our missionaries, and they are deeply rooted in the beautiful tradition of the Classical Latin Mass. 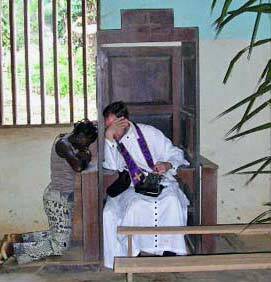 For our missionaries, Gabon, with its difficult atmosphere, murderous climate, and ever-present malaria, is a very hard country to work in, but the satisfaction given to them by the openness of the African population, through conversions and hundreds of baptisms every year, equals the strain on their health and all the hardships that they must endure. We should always keep them in our prayers and not forget that not only the Institute of Christ the King but the whole Church must be missionary. Please consider a donation to keep our African missions supplied and successful.